Want the short answer? Everything effects them! Shortest learning center article EVER! Woohoo! So, Now you have your clivia and its spiked for the first time! What should you expect? 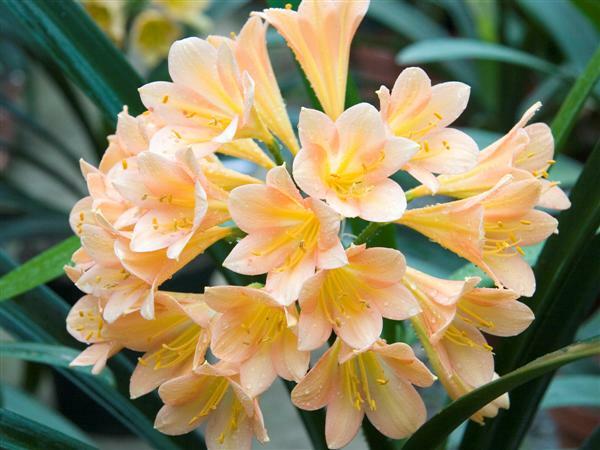 Well, the first thing we should remember when growing Clivia is that its a hobby that rewards patience. Generally your first bloom will be smaller, a slightly different color than expected (Somtimes even a much different color than expected) and with fewer blooms than expected. This is NORMAL. 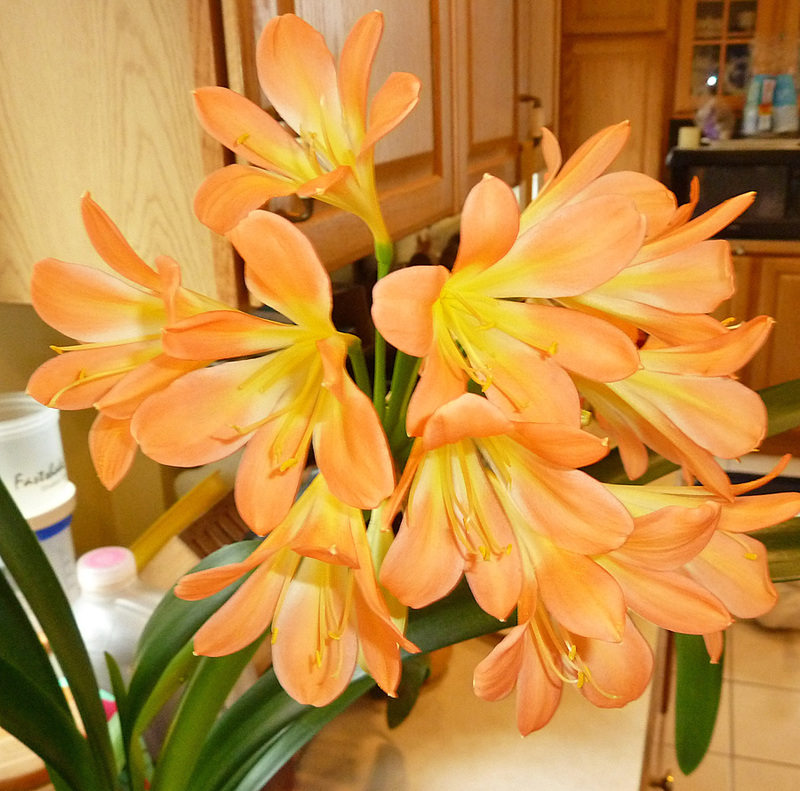 You wont know how many blooms your Clivia is really capable of until its third season. Sometimes a plant will keep the same number of blooms every year, and sometimes they will increase. And here it is in its 2nd year. 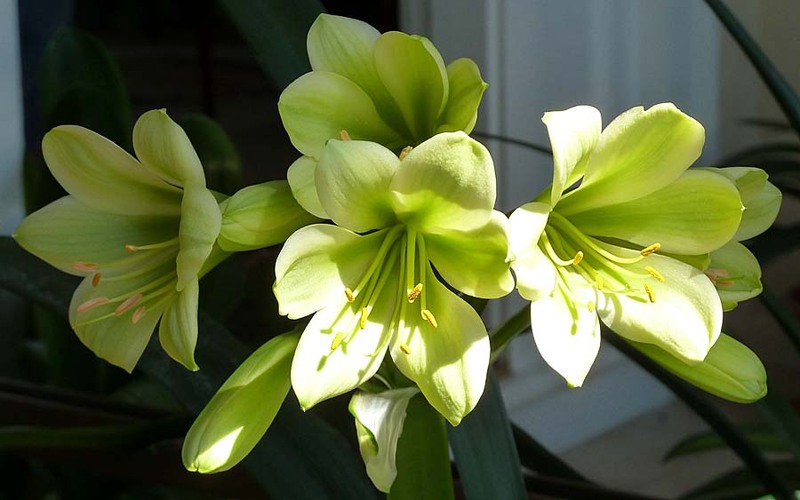 We saw an increase in blooms of 4 blooms as well as a deepening of the green color in the flower. 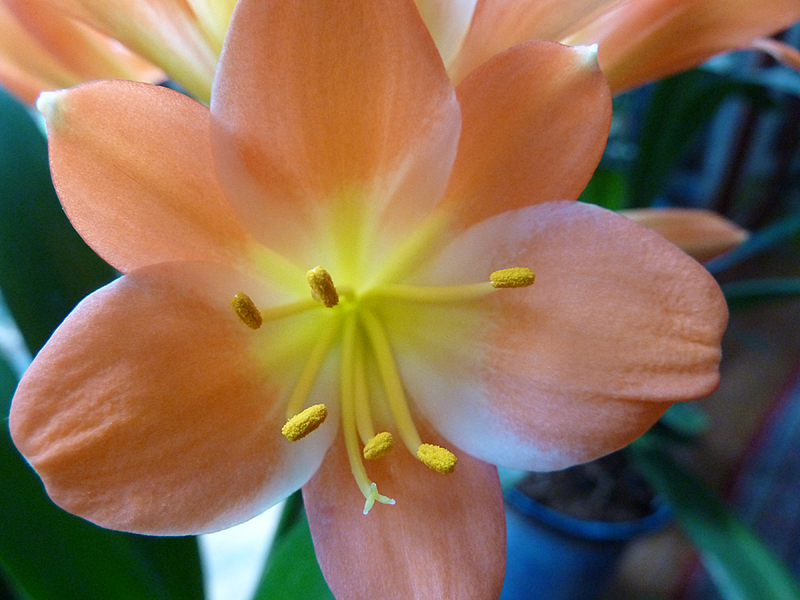 We all buy our clivia (Us included for our own collection) based on flower pictures of the parent plants. Oftentimes our personal plants bloom with fewer flowers (Even the offsets) than the original mother plant had in South Africa. Generally plants blooming in our homes will put out somewhere between 13-30 florets. 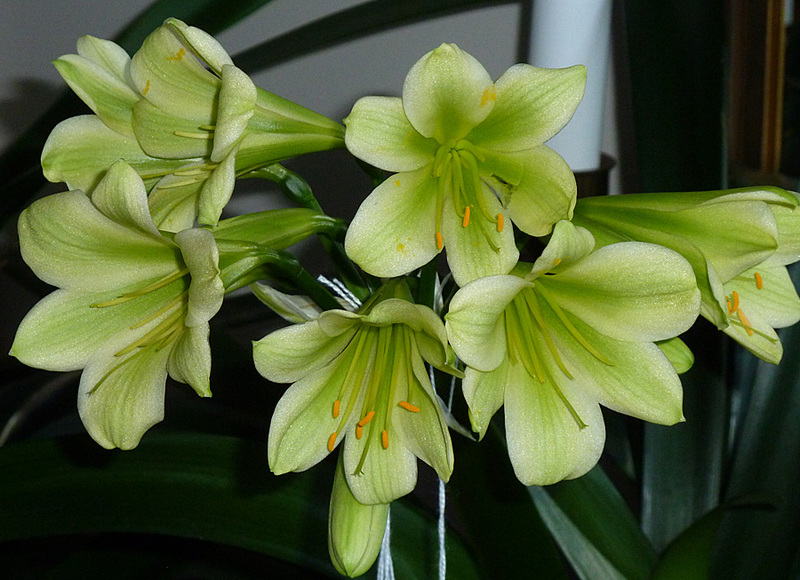 Which is about average for Clivia. Why do we get fewer blooms than our South African and Californian associates? Well, We happen to live in Massachussets, where we have a shorter and colder growing season than many. This affects the bloom count. So does how the plant is fertilized, How its watered, even how much light it recieves during the year. If you have been reading our learning center articles you know how we do each of those things. Once you get things settled down and you can successfully bloom your plant year after year, experiment! You may find that given your different environmental conditions different fertilizer levels etc will produce better results. We have for instance been experimenting with Cartenoids from Seaweed with some positive results. First bloom color and shape can vary pretty strongly from the mother plant if an offset or from the 2nd year for a seedling. Dont give up on a plant after the first year! Some things should be the same however. 1: An expected yellow from an offset should be yellow. Not orange, not pink, Yellow. Seedlings are always a genetic pull of the slot machine, so just because you expected yellow does not mean you will get yellow. Yellow to Yellow from the same group should create Yellow. Yellow to "X Split for yellow" with a clear base...maybe not. 2: A red wont be peach, Pink, Pastel. It might be a dark Orange. This happens often with Reds and we will get into that a bit more in a bit. 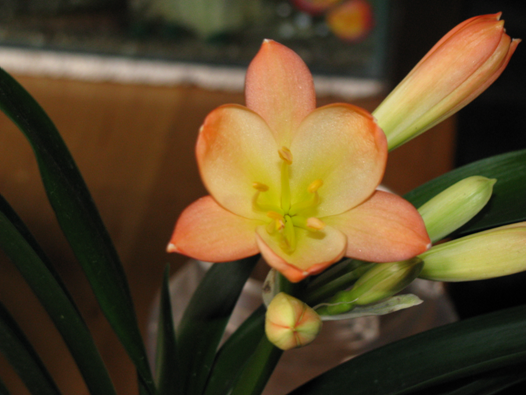 Oftentimes the first bloom of a Clivia will have Thinner petals or a Picotee (Thin color Border) Look to it, this is something you have to expect to change in the second year, Which considering how pretty that look can be can be a dissapointment sometimes. Below is the first bloom of one of our own crosses to give you an idea what we are discussing here. Pretty terrible picture but you can get the drift. Most likely this will not bloom the same next time around. Sometimes the first flower will look like this on the first bloom, and then the next ones opening will look different! There is a reason that many of us have been on the hunt for the "perfect" red for a very very long time...and thats because Red clivia seem to be strongly affected by light as well as genetics. Give a red plant to little light while its developing and you will have yourself a very nice Orange Red. To much light and you have yourself a nice piece of cardboard! My understanding on reds is such: How red the plant has the ability to get is based on the genetics of the plant. A Christie Cardinal Red, The reddest red currently known, has the ability to be a deep dark almost maroon. Put it in the wrong light and it will be an orange red. A quick note on Picotee pattern. This is where the bloom has an unbroken edging either of color or of white along the outer rim of the floret. We own one of the more famous examples of this type of plant called "Painted Lady", perhaps one of the first picotees developed. Ours changes from a picotee to a bicolor and back from year to year. This is a known factor with Painted Lady and I believe with other Picotees as well. 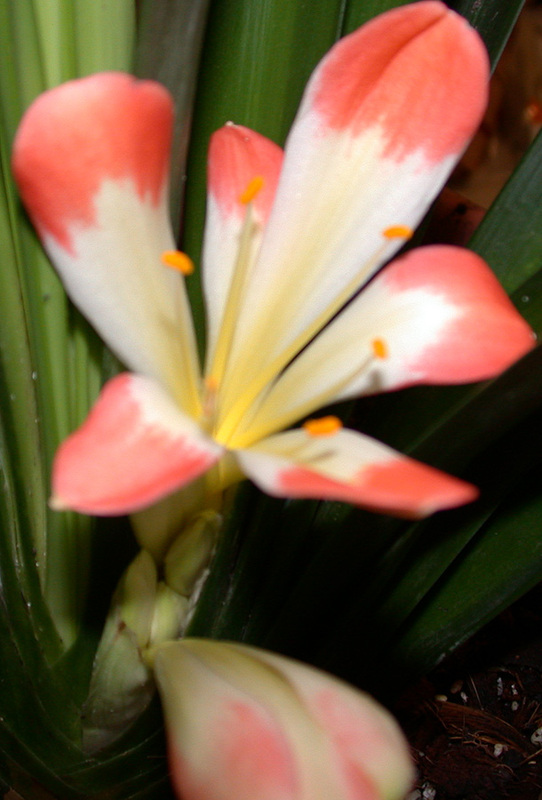 We have seen a few excellent examples of picotees in clivia but they still tend to be fairly rare. Painted Lady with a wider throat. This one area should be somewhat the same (with the exception of petal width) from bloom to bloom and from year to year. If something blooms tulip shaped in the first year, you should expect Tulip to Cup shape in the next blooming. Open flowers should remain open, etc. As with any other flower environmental factors play a decent sized role in flowe development. No cold period for instance often means stuck and shortened flower scapes. Fertilizer, light, trace elements. simple changes in temperature from one home to another..all these things effect the blooms most especially flower count. As previosly stated Reds in particular are very light conscious. This is the same with all flower colors really but the as the reds turn to dark orange it can be particularly dissapointing in that case.